Southern California has an extraordinary history of fantastic astrophotographers. Due to a very big community of amateur astronomers, glorious weather, and beautiful natural surroundings, top quality astrophotography has always been associated with California. The University of California, Riverside, through a National Science Foundation grant awarded to Prof. Gillian Wilson (Dept. of Physics and Astronomy), invited all interested astrophotographers to submit their work to be selected for a public exhibition at the Orbach Science Library on-campus. Twelve images were to be selected, but having received over 70 submissions we had a hard task deciding amongst such beautiful images. We tried to include as many photographers as possible, while showcasing the widest variety of cosmic objects, and securing the highest picture quality by astrophotographers working in California. The exhibition FOCUS ON THE UNIVERSE: ASTROPHOTOGRAPHERS OF SOUTHERN CALIFORNIA is then composed of 17 images printed over metal, which we are sure you will love. The exhibition will be inaugurated on Thursday May 26th, at noon, in the Orbach Science Library, and will be open from May 26th until June 29th, 2016. It is public and free. The exhibition is open during the same schedules as the library. If you are visiting, the best option is parking at Lot 10, which is just a few steps away from Orbach. The exhibition will be offered on loan to public schools and libraries on the area so this wonderful work by astrophotographers will be widely known. 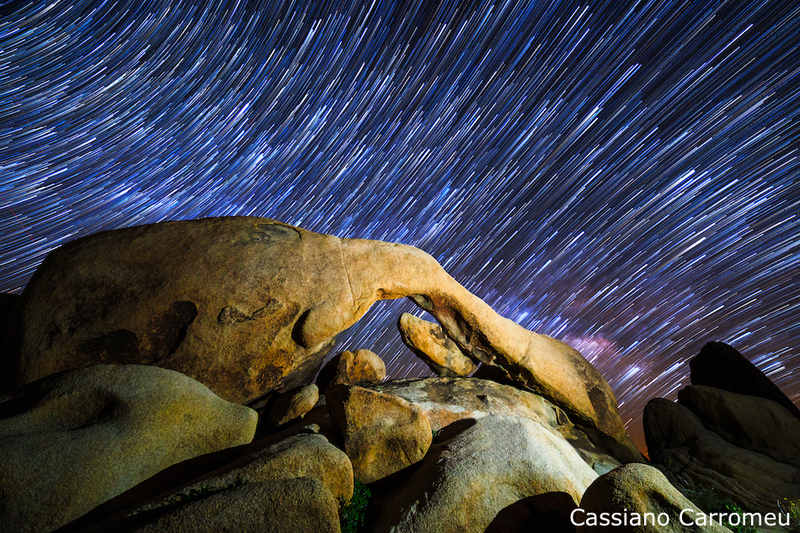 Star trails from the the Arch Rock at Joshua Tree National Park, CA. Credit: Cassiano Carromeu.